If a hit West End play can be made out of Bohr meeting Heisenberg, there must be some promising dramatic material in the blame-game now unravelling in Whitehall. Airports, energy providers, local authorities and health trusts were caught short by record cold weather extremes this year, for the third winter running – raising questions about the preparedness of the national infrastructure, and the quality of the meteorological advice these agencies receive. And it's not an academic dispute: cold weather kills thousands of people each year, with UK citizens suffering one of the worst winter "excess" mortality rates in Europe. According to figures published by Office for National Statistics, there were 25,400 additional deaths in 2009/10 than in a comparable non-winter period. The state largely relies on forecasts by the Met Office, a £170m branch of the Ministry of Defence. 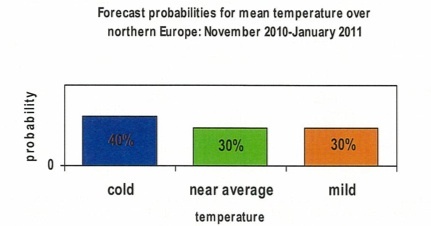 Until the Met Office stopped providing long-range weather forecasts – because they damaged the "brand", according to internal documents – nine of the last 10 winters had turned out to be warmer colder than the agency forecast. Is the Met Office being used as a scapegoat for cash-strapped councils, as an excuse for cut-backs in essential infrastructure? That seems not to be the case, as the authorities cite Met Office advice, and climate change, as a primary factor in their planning. Based on Met Office advice, an independent audit of national preparedness PDF 1.1MB advised local authorities to reduce gritting levels. "The Met Office advice to our main Review earlier this year was that severe winters have only a 1 in 20 chance, that the weather in any one winter is virtually independent (statistically speaking) of weather in preceding winters, and that this incidence is slowly declining due to global warming; however, one important effect of global warming is that more snow is possible when severe weather events do occur." "A study of England's preparedness for winter travel disruption has recommended that councils share salt stocks and reduce gritting levels. Under the new guidelines, authorities would have enough capacity to grit their most important roads 48 times over a 12-day period rather than the current recommendation of 24 gritter runs over six days." In other words, money spent on preparing for cold weathers, by taking measures such as stockpiling salt, may be a waste of money – or in Quarmby's words, may have "limited or no value when winters are average or mild". What is the Mystic Met really saying? Now documents disclosed by the Cabinet Office under the Freedom of Information Act dispel the idea of a "secret" weather forecast for Government officials that contradicted public statements, by warning of an extremely cold winter. The notion of an advance warning that was shared with mandarins but not disclosed to the public, was planted by BBC environment analyst Roger Harrabin earlier this month, in his Radio Times column. "The truth is it [The Met Office] did suspect we were in for an exceptionally cold early winter, and told the Cabinet Office so in October. But we weren’t let in on the secret." (Our emphasis). Is this true? Readers can judge for themselves. The public forecast made in a probability map in October is vaguely warm. It gave a 60 to 80 per cent chance of warmer-than-average conditions for much of England and Wales, and an 80 per cent chance of warmer-than-average conditions for Scotland. The Met's non-committal "Initial Assessment of Risk" for November-January, delivered privately in October, is even vaguer, and looks like this. It gave a 70 per cent change of "near average or colder" but a 60 per cent chance of "near average or milder" conditions, too. The numbers were confirmed in a Parliamentary answer to Lord Lawson, the former Chancellor, last week. The two forecasts diverge – but there's no smoking pistol – and not much evidence for an "exceptionally cold" winter, which Harrabin claimed the Met privately predicted, and which the Met apparently confirmed. If such a forecast exists, this isn't it. "It boggles the mind that aside from the tiny amount of actual prediction in the report that this is the output of their energy-guzzling, multi-million pound supercomputer," the Katabasis blog, which was the first to lay its hands on the documents, notes. The blogger points out another consequence of poor forecasting. The National Grid was also caught short by the prolonged cold snap, with energy demand far higher than it forecast. The Grid had relied on the Met Office probability map which suggested "a 0 – 20 per cent probability of below normal temperatures". "The Met Office has never suggested that we warned cabinet office of an 'exceptionally cold early winter'. The forecasts said that there was 'an increased risk for a cold and wintry start to the winter season'. The Met Office provided a forecast to the cabinet office that showed that there was an increased risk of an average or cold start to winter over an average or mild winter. This along with a verbal briefing and the text that highlighted a 'increased risk of a cold start to the winter season' all provided useful guidance to the cabinet office." In October, WSI predicted a colder-than-average December for the UK, but a warmer-than-average January, a forecast that seems to have been confirmed by events. 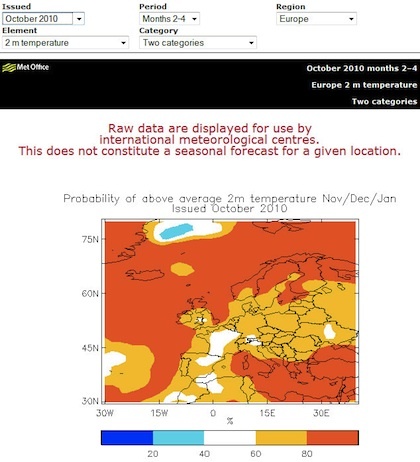 It now predicts a big freeze for continental Europe, and for the UK, a mild February but colder-than-average March and April. Harrabin isn't the first journalist to be left out to dry by a dodgy source, but for state agencies dependent on accurate medium-term forecasts, the issue is far more serious than a bruised reputation. The Commons Transport Select Committee will this month examine whether the climate has changed – in the opposite direction to what climate change activists have been predicting.